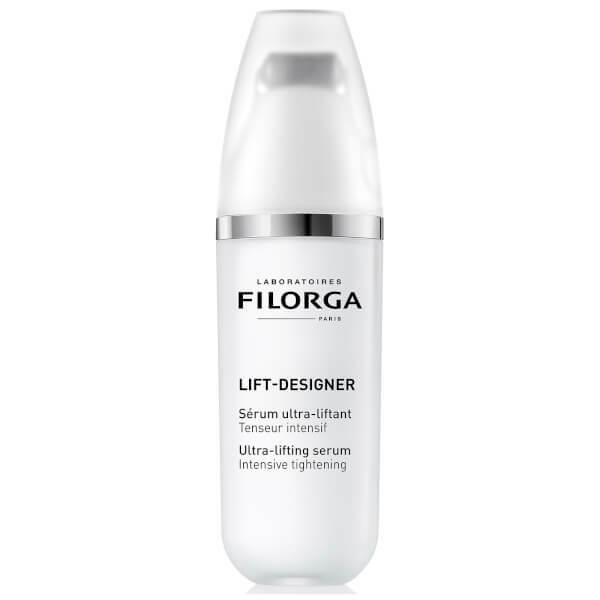 Rediscover your skin's youthful capacity with Filorga Lift Designer Treatment, an anti-ageing serum that delivers a firming and lifting effect to redefine the appearance of skin. Hold the product upright. Start the pump by pressing down the push button to bring the product up to the applicator. When you first use it, you may have to pump several times before the product appears. As soon as the product appears under the roll-on applicator, apply the formula to the areas affected by sagging (facial contours, cheekbones, neck, décolleté, etc.). Use the fingertips to apply the product over the entire face. 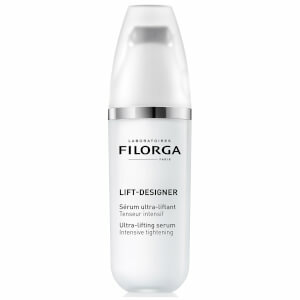 Use morning and evening for an enhanced tightening effect. Maintenance Tips: After each use, remove the roll-on metal cap, rinse it gently and wipe it with a tissue. Aqua (Water), Glycereth-26, Caprylic/Capric Triglyceride, Isodecyl Neopentanoate, Ethylhexyl Palmitate, Glycerin, C14-22 Alcohols, Hydroxypropyl Methylcellulose, Boron Nitride, Pullulan, Phenoxyethanol, Hydroxyethyl Acrylate/Sodium Acryloyldimethyl Taurate Copolymer, Curcuma Longa (Turmeric) Root Extract, Parfum (Fragrance), C12-20 Alkyl Glucoside, Sucrose Palmitate, Secale Cereale (Rye) Seed Extract, Maltodextrin, Polyisobutene, Sodium Polyacrylate, Ethylhexylglycerin, Hydrolyzed Ulva Lactuca Extract, Citric Acid, Glyceryl Linoleate, Squalane, Peg-7 Trimethylolpropane Coconut Ether, Prunus Amygdalus Dulcis (Sweet Almond) Oil, Porphyridium Cruentum Extract, Sodium Chloride, Pentylene Glycol, Trihydroxystearin, Sorbitan Isostearate, Plankton Extract, Peg-8 Dimethicone, Lecithin, Polysorbate 60, Sodium Citrate, Soluble Collagen, Sodium Hyaluronate, Sodium Hydroxide, Glucose, Sodium Benzoate, Sodium Ascorbate, Potassium Chloride, Potassium Sorbate, Calcium Chloride, Phytic Acid, Magnesium Sulfate, Glutamine, Sodium Phosphate, Tocopherol, Ascorbic Acid, Sodium Acetate, Lysine Hcl, Arginine, Alanine, Histidine, Valine, Leucine, Threonine, Isoleucine, Tryptophan, Phenylalanine, Tyrosine, Glycine, Polysorbate 80, Glucomannan, Serine, Deoxyadenosine, Cystine, Cyanocobalamin, Deoxycytidine, Deoxyguanosine, Deoxythymidine, Glutathione, Asparagine, Aspartic Acid, Ornithine, Glutamic Acid, Nicotinamide Adenine Dinucleotide, Proline, Aminobutyric Acid, Methionine, Taurine, Hydroxyproline, Glucosamine, Coenzyme A, Glucuronolactone, Sodium Glucuronate, Thiamine Diphosphate, Disodium Flavine Adenine Dinucleotide, Sodium Uridine Triphosphate, Retinyl Acetate, Inositol, Methyl Deoxycytidine, Niacin, Niacinamide, Pyridoxal 5-Phosphate, Pyridoxine HCL, Biotin, Calcium Pantothenate, Folic Acid, Riboflavin, Tocopheryl Phosphate.